Frequent Mosquito Bites? Watch Out for Dengue! Dengue outbreak is not just common in small towns or the metropolitan cities of India, but also in Africa, South East Asia, Latin America and other tropical countries. Dengue is caused by the bites of mosquitoes that carry the dengue virus. This virus cannot spread to people through casual contact. 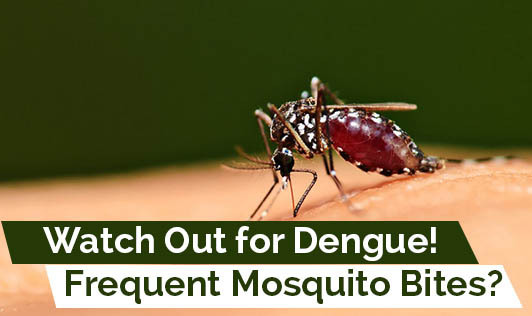 A person infected with dengue should avoid contact with mosquitoes, as the virus can spread to others when the infected mosquito bites them. A few symptoms of dengue fever include sudden high degree fever, eye pain, headache, joint and muscle pain, skin rashes, nausea, vomiting or loss of appetite. The fever may come and go and may last up to a week. After these initial symptoms, a few people may even show up signs of dengue hemorrhagic fever like severe belly pain, black stools, vomiting blood, red patches that look like bruises or tiny spots etc. A blood test will confirm dengue. Your Doctor can also arrive at a diagnosis based on recent history of travelling and the symptoms. Treatment is given based on the symptoms. The basis of the treatment is good hydration by increasing the fluid intake. Anti inflammatory drugs are avoided as they may increase the risk of bleeding. IV fluids or blood transfusion is given in the hospital stay to treat dehydration or blood loss in case of hemorrhagic fever. Keep your place and the surrounding clean to avoid water accumulation that attracts these deadly mosquitoes. Use protective clothing while travelling. Also stack up mosquito repellants, bed nets, mosquito sprays and use them regularly and especially during the rainy season. Enjoy this monsoon and keep dengue at bay!